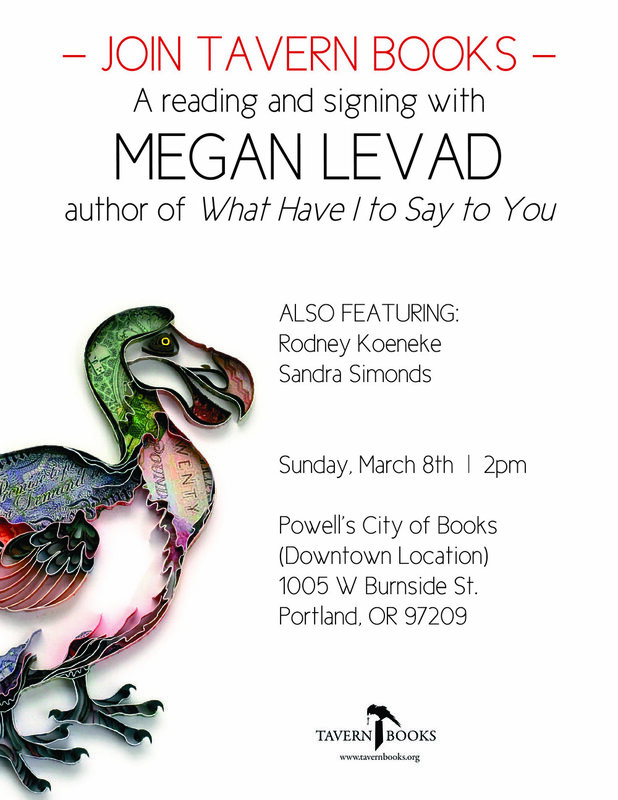 Join Tavern Books for a reading by Megan Levad at Powell's Burnside! Levad will read from her new collection, What Have I to Say to You, and will be joined by Rodney Koeneke (Body & Glass, Wave Books) and Sandra Simonds (Orlando, Wave Books). Megan Levad is the author of two Tavern Books titles: Why We Live in the Dark Ages (2015, http://www.tavernbooks.com/books/why-we-live-in-the-dark-ages) and What Have I to Say to You (2018, http://www.tavernbooks.com/books/what-have-i-to-say-to-you). Levad's poems have appeared in Tin House, Fence, Denver Quarterly, Mantis, the Everyman’s Library anthology Killer Verse, and London art and fashion magazine AnOther. She also writes lyrics for composers Tucker Fuller and Kristin Kuster. A native of rural Iowa, Megan currently lives in San Francisco.